Men who survived being thrown into a deep well by the Japanese in 1945. Image source: United States National Archives. The men showed in the picture above were the lucky ones who were rescued after having been shoved down deep wells and then shot at by the Japanese in 1945. This mode of “extermination” of civilians was performed by Japanese soldiers in other parts of Lipa, and was documented even in the town of Taal. Original Caption: Into deep wells in Lipa, Batangas, P.I. (for Philippine Islands), the Japs threw civilian men, women and children, and then shot at them. Here are five victims who were rescued. 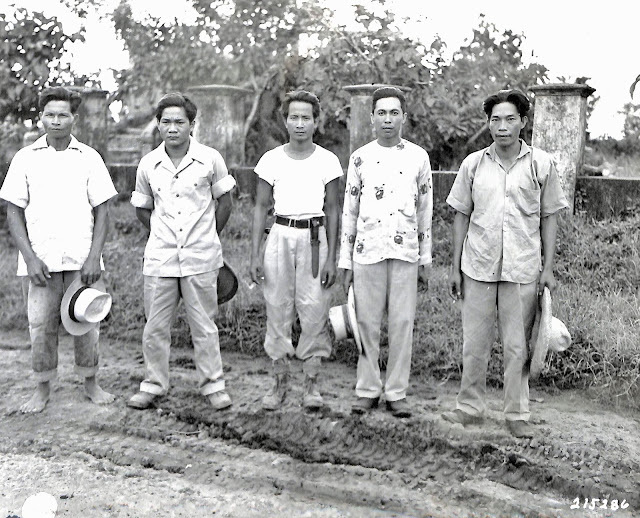 Left to right: Mauricio Olan; Marciano Topay; Eugenio Latina; Pampilo Umali; and Teodore Argans (Argana? ).